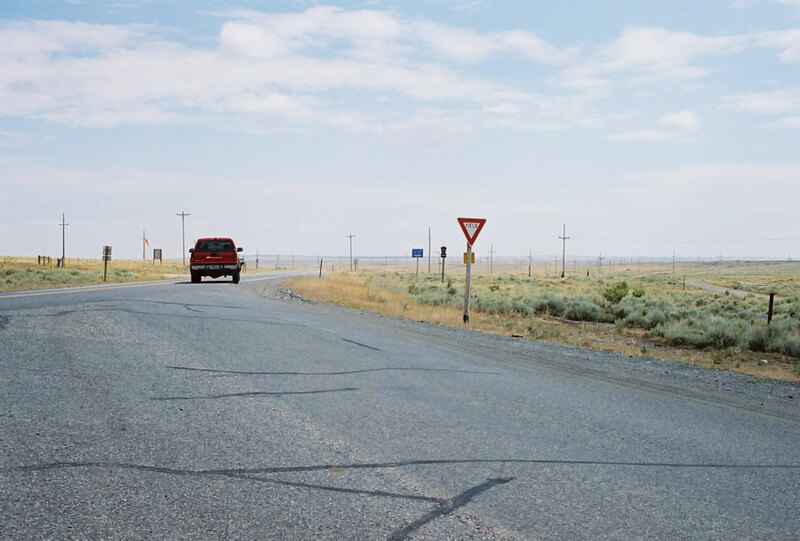 Reconstructed in the late 1990s to include newly paved sections over the Sierra Madre Mountains in southern Carbon County, Wyoming 70 (Battle Highway) has several pull-outs along its east-west route between Baggs and Encampment. A rest area is also available here. Like most Wyoming highways that cross high mountain passes, Wyoming 70 is closed during the winter months. Photo taken 8/98. 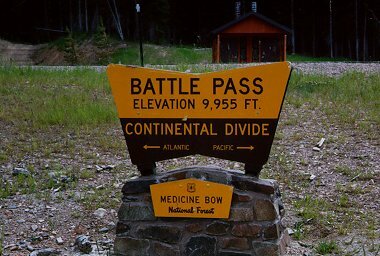 Wyoming 70 crosses the Continental Divide at Battle Pass (Elevation 9,955 feet). This sign indicates the direction of water flow from the divide toward the Atlantic and Pacific Oceans. Photo taken 8/98. Eastbound Wyoming 70 enters the town of Encampment after descending from Battle Pass. A recent thunderstorm had drenched the area, making for a spectacular light show on top of the pass. Photo taken 8/98. Wyoming 74 is a very short, unsigned route consists entirely of a bridge that connects Bridge Street on either side of it in downtown Saratoga. The state maintains the bridge, and the approach streets on either side are maintained locally. The bridge crosses the North Platte River. Photo taken 09/06/05. Wyoming 89 begins in the shadow of Interstate 80 Exit 5 in Evanston. 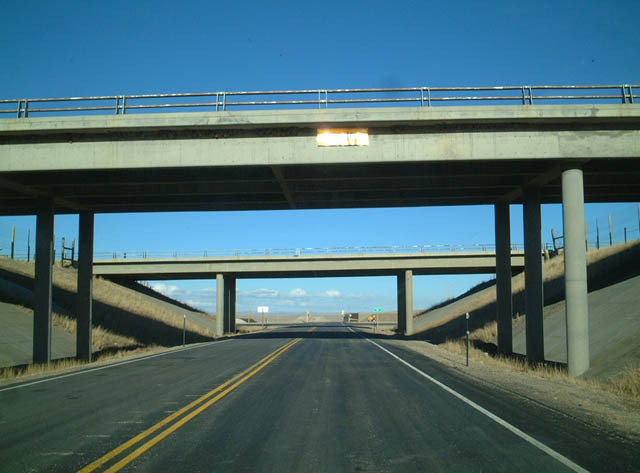 To the south of this interchange, Wyoming 150 travels south to join the Mirror Lake Scenic Byway over the High Uintas. To the north, Wyoming 89 enters downtown Evanston, then continues north, with a brief jaunt into Utah via Utah 16 and Utah 30 to serve Woodruff and Randolph. Returning to Wyoming southwest of Sage, Wyoming 89 continues north, again crossing briefly into Idaho via Idaho 61, where it ends at U.S. 89. Photo taken 09/06/05. 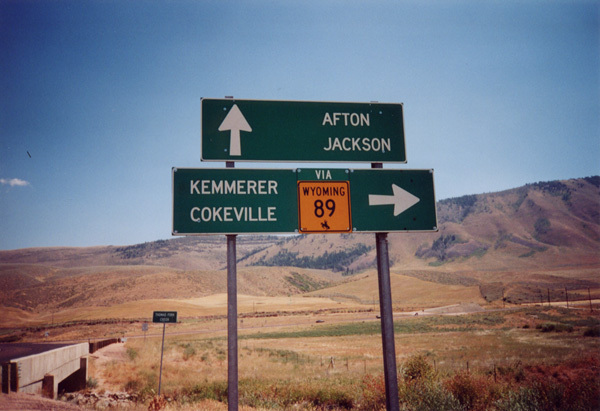 Wyoming 89 straddles the Wyoming-Idaho state line in western Wyoming, offering a north-south corridor between Evanston and Star Valley (Afton). 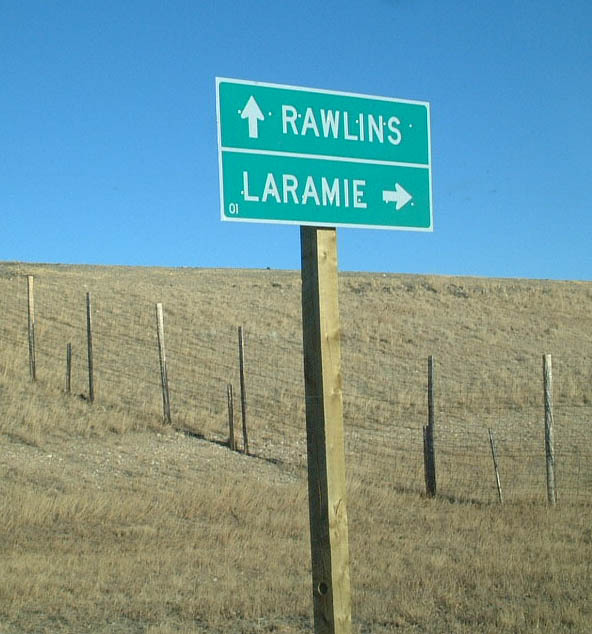 As a result of straddling the state line, certain sections of Wyoming 89 leave the state. Here, the continuation of Wyoming 89 is Idaho 61. 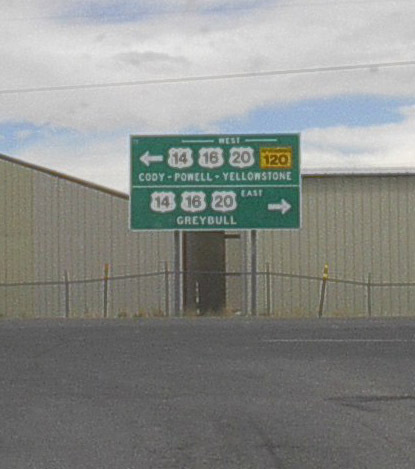 Signage for Wyoming 89 is placed by the Wyoming Department of Transportation at the intersection of northbound U.S. 89 and Idaho 61. 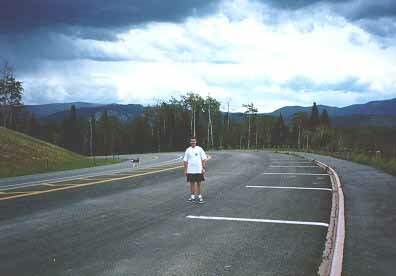 Photo taken by Zach Maillard in 2000. 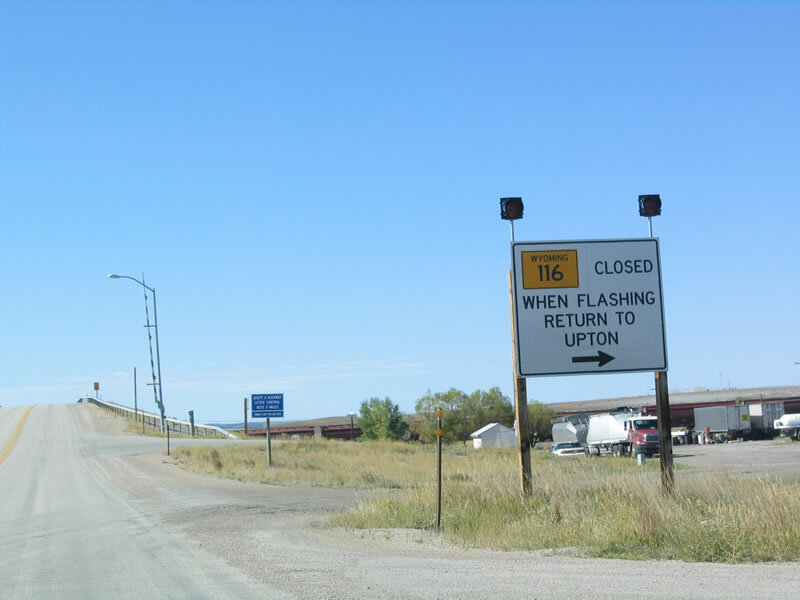 Northbound Wyoming 116 approaches U.S. 16 in Upton, a town in northern Weston County. Photo taken 09/04/04. 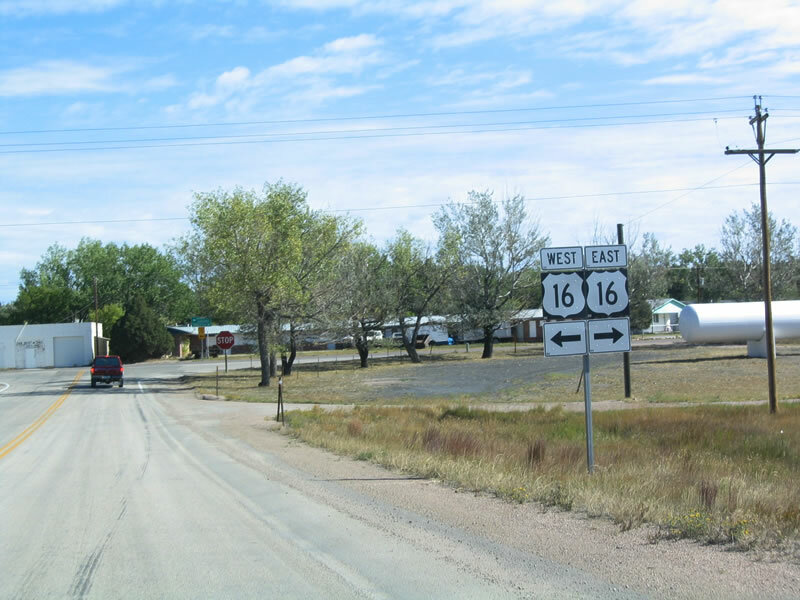 To continue north on Wyoming 116, turn left (west) on U.S. 16. 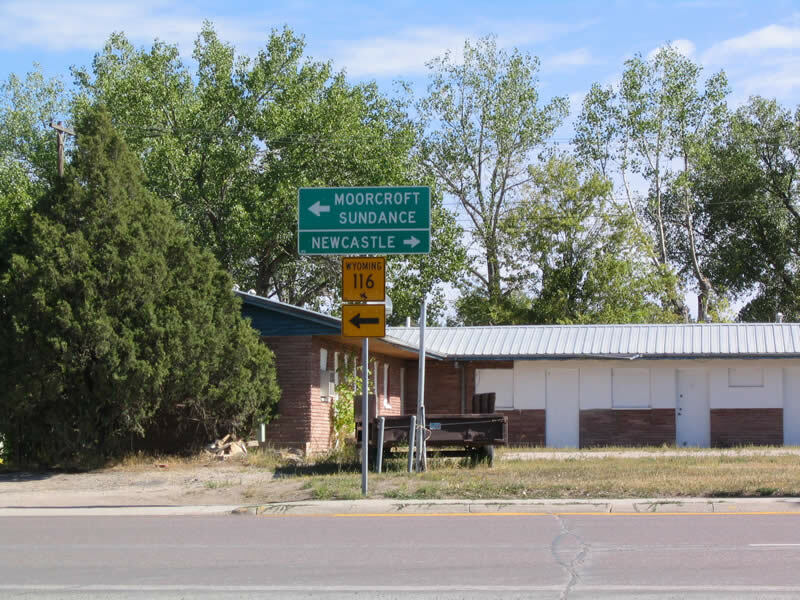 Downtown Upton, as well as Moorcroft and Interstate 90, are located along westbound U.S. 16. To the southeast, U.S. 16 travels toward Osage and Newcastle before entering the Black Hills region. Photo taken 09/04/04. When the yellow beacon lights are flashing, all traffic must return to Ucross until the highway reopens. Normally this is used in periods of inclement weather or traffic advisories. Photo taken 09/04/04. 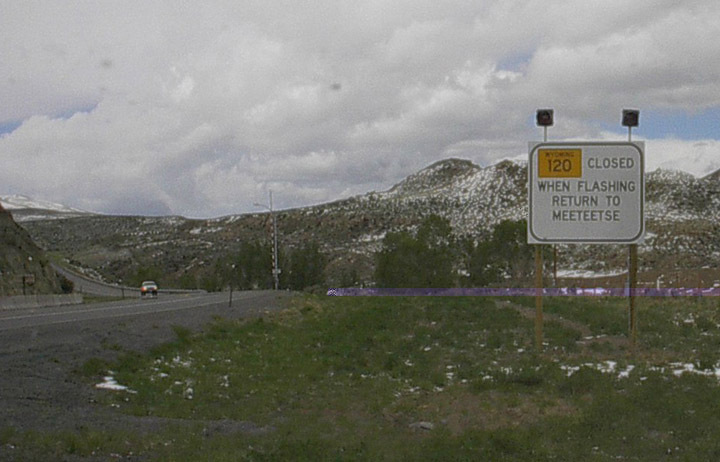 Like most highways in rural areas, closures during inclement weather (such as winter snowstorms and windstorms) are posted by white regulation signs such as this one. When the yellow beacons are flashing, Wyoming 120 is closed to all traffic. Photo taken by Dale Sanderson, 4/01. 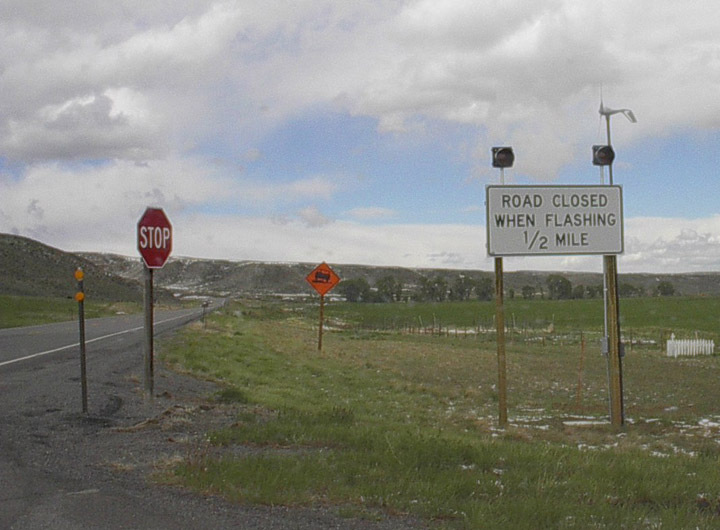 A half mile further along the highway is this sign indicating that Wyoming 120 is closed when the lights are flashing, and all traffic must return to Meeteetse. Photo taken by Dale Sanderson, 4/01. 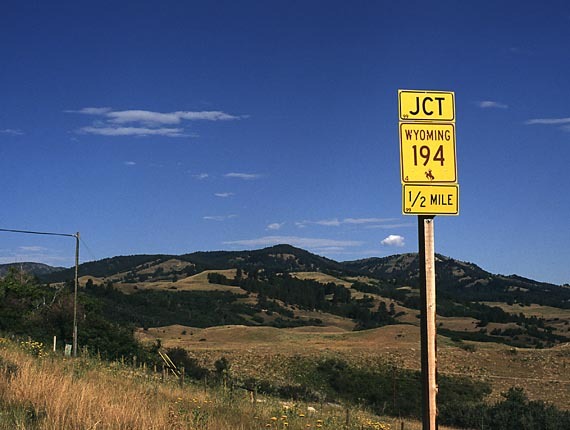 Further to the north, northbound Wyoming 120 approaches its junction with U.S. 14-16-20 in Cody, just east of Yellowstone National Park. Photo taken by Dale Sanderson, 4/01. Wyoming 193 approaches its junction with Wyoming 194. Photo taken 10/00 by Jonathan Winkler. 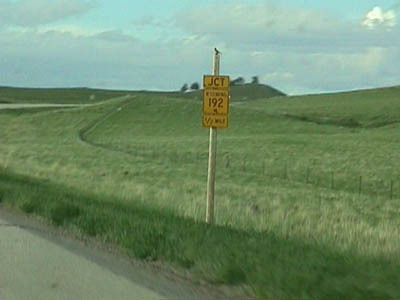 Immediately after the Wyoming 94 intersection is this reassurance marker for Wyoming 193. Photo taken 10/00 by Jonathan Winkler. 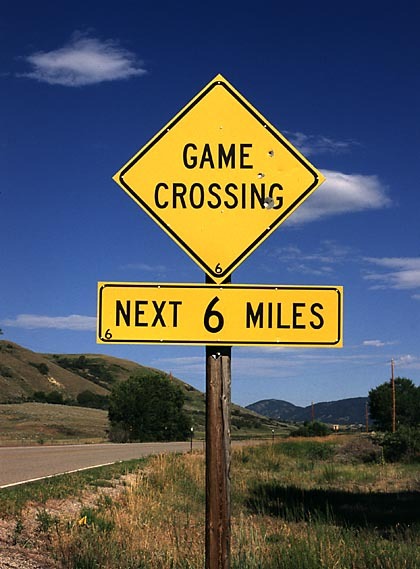 These game crossing signs are located on Wyoming 193 near Banner. Photos taken 10/00 by Jonathan Winkler. 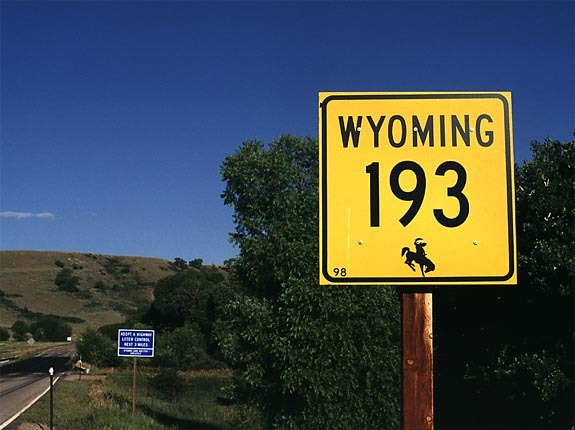 Wyoming 196, which follows Old U.S. 87 between Kaycee and Buffalo, connects with several state routes near its southern end. Here, northbound Wyoming 196 approaches its junction with Wyoming 192. Photo taken 08/98. 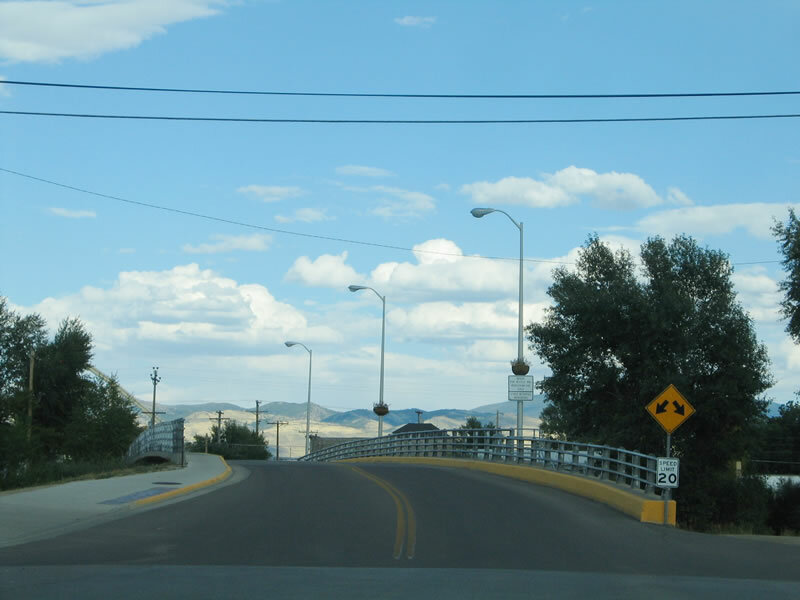 Wyoming 220 west begins on Poplar Street, and it travels south along Poplar Street through western Casper. The highway then angles southwest on CY Avenue en route to Independence Rock, Alcova Reservoir, Pathfinder Reservoir, and Muddy Gap. Prior to 1938, this route was signed as U.S. 87E. 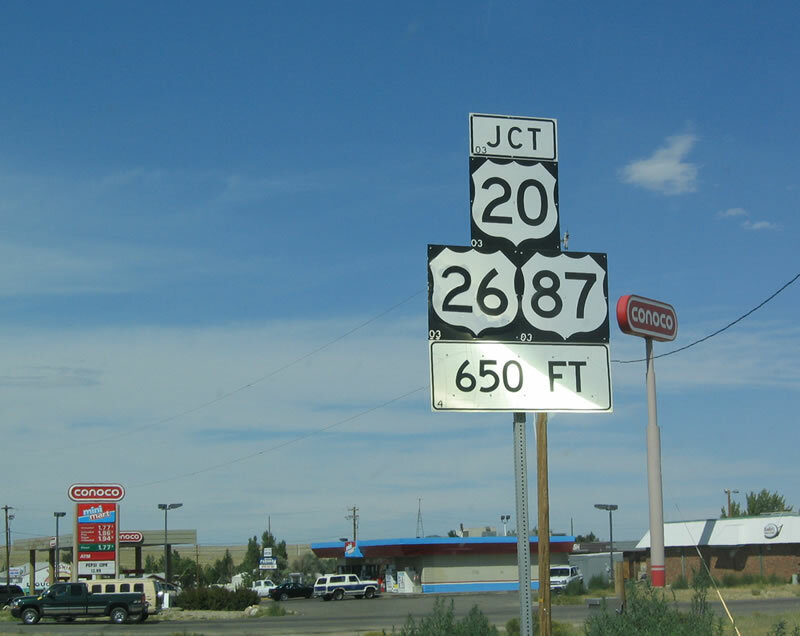 Wyoming 220 ends at U.S. 287, which connects to Rawlins (south) and Lander (northwest). Photo taken 09/01/04. Wyoming 251 ascends the north face of Casper Mountain. 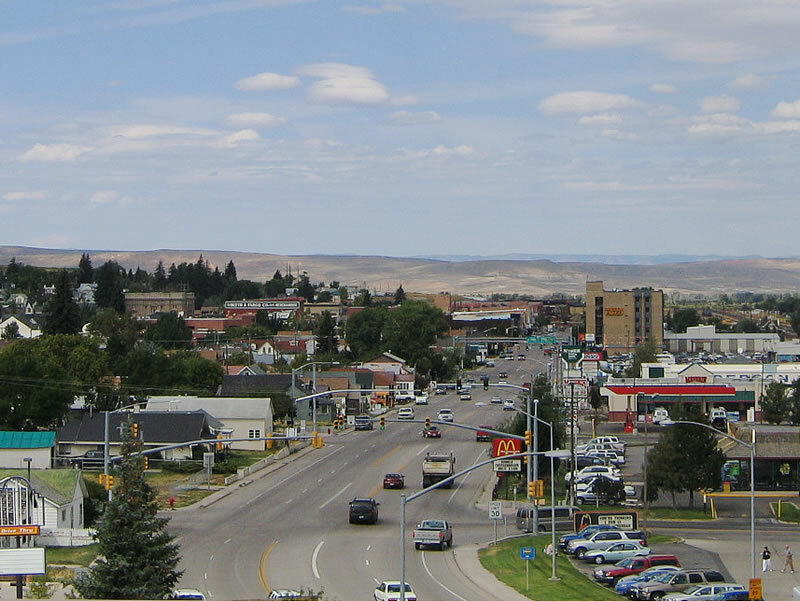 As the highway snakes up the mountain, the view of the Casper metropolitan area comes into view. Wyoming 251 continues south to the top of Casper Mountain before ending at Hogadon Ski Area. Photo taken in 1993. 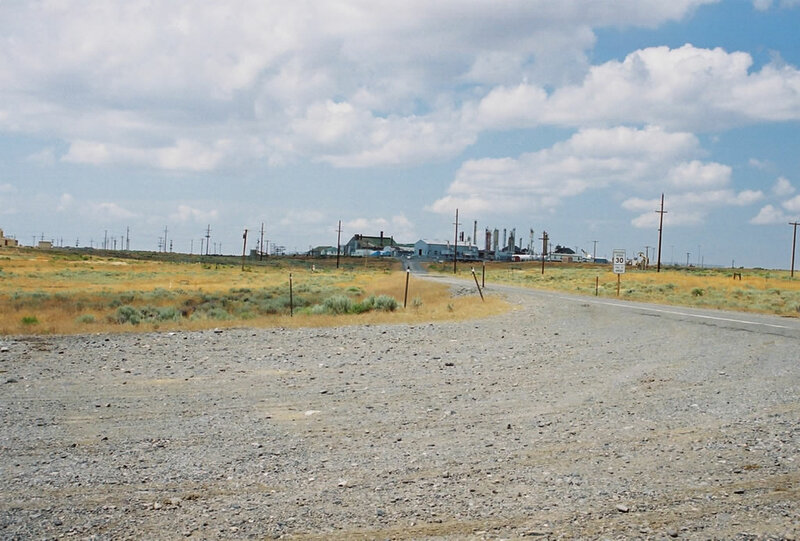 Wyoming 258 is the Casper Beltline, offering a connection around the city of Casper via the southern and western edges of the city. 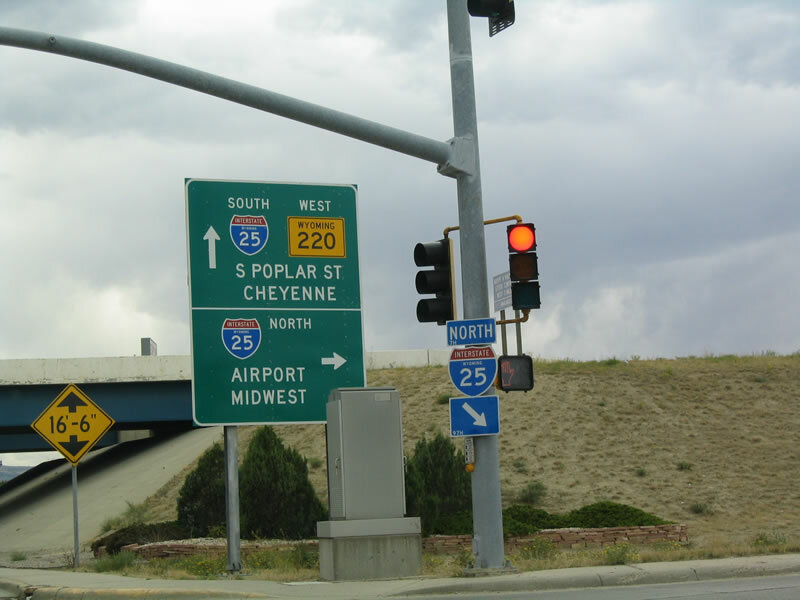 The state highway ends here at the U.S. 20-26-87 intersection east of downtown Casper, and it begins on Wyoming 220 southwest of downtown Casper. 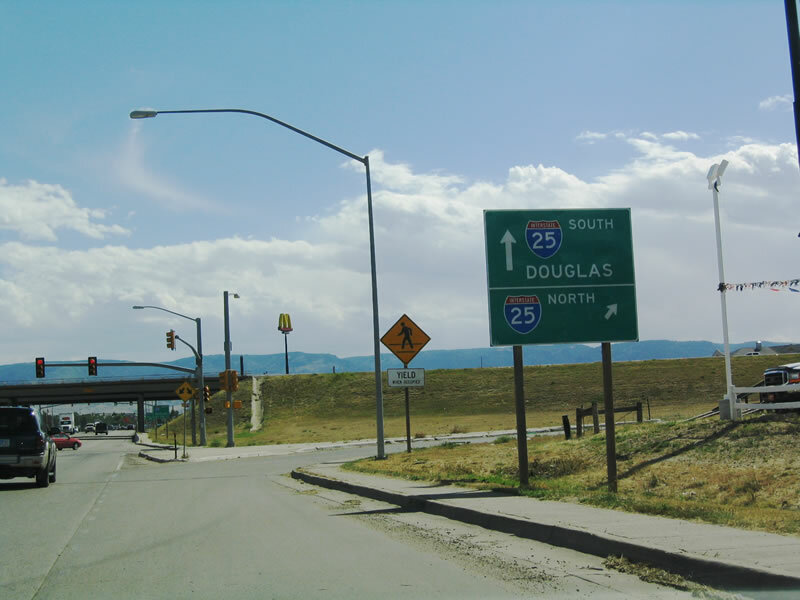 After the U.S. 20-26-87 intersection, Wyoming 258 south approaches its junction with Interstate 25. Continue south on Wyoming 258 to Casper College and to Wyoming 251 en route to Casper Mountain. Photo taken 09/01/04. This view shows Wyoming 295 as it travels north toward the town of Elk Basin and nearby mining and gas facilities. 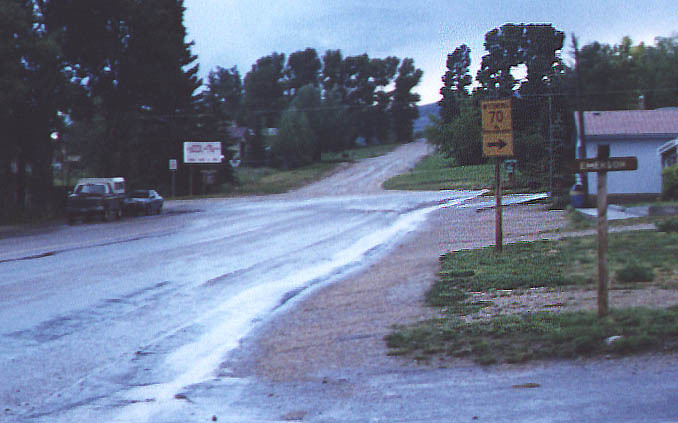 Eventually the road hooks up with a gravel road to lead to Belfry, Montana, and eventually Junction Montana 72. Photo taken Alfred Regnery (07/27/2007). 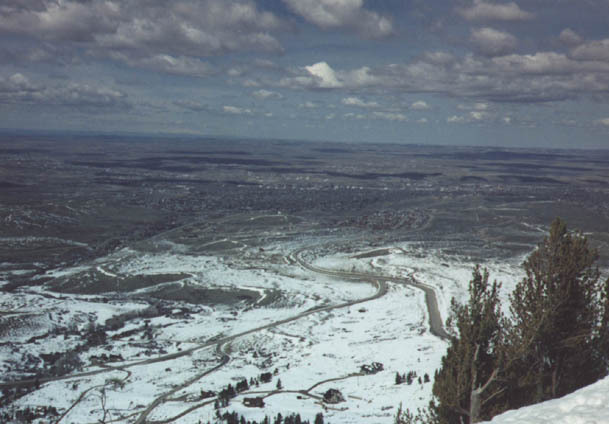 This view shows Wyoming 295 leading south from Elk Basin to Powell. The section of the highway passes through farmland as compared to the mining extraction activities further north along the state highway. Photo taken Alfred Regnery (07/27/2007). Wyoming 387 connects Interstate 25 near Midwest with Wyoming 59 near Wright. Here, northbound Wyoming 387 approaches its junction with Wyoming 192. Photo taken by Mike Ballard, 08/98. The next three signs provide instructions to northbound traffic on Wyoming 585 as the highway approaches the Port of Entry near Sundance. 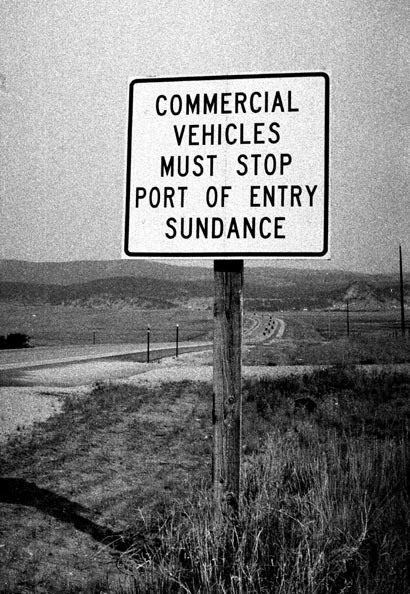 The main sign in this assembly indicates (to northbound traffic on Wyoming 585) that even vehicles which are legally regarded as merchandise in transit must stop at the port of entry in Sundance. 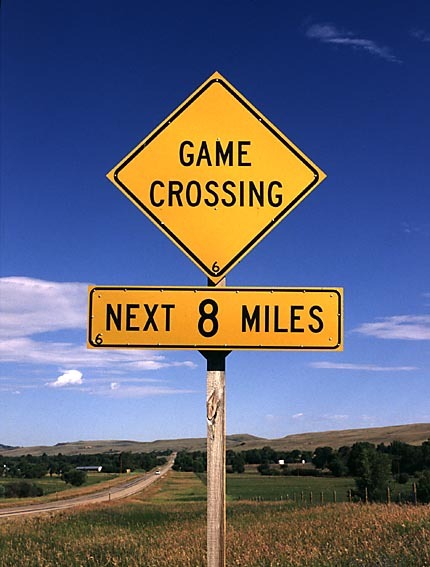 In Wyoming it is traditional for the last sign in a port-of-entry approach sequence to give the hours the port is open, and the supplementary plate serves this function. Photo taken by Jonathan Winkler, 08/00. 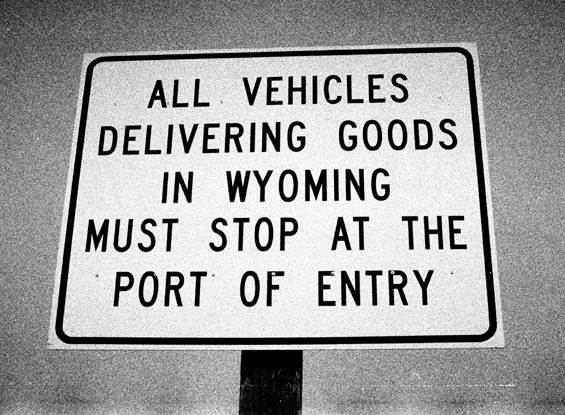 The next sign in sequence indicates that all vehicles delivering in the state of Wyoming must stop at the Port of Entry on northbound Wyoming 585. Photo taken by Jonathan Winkler, 08/00. 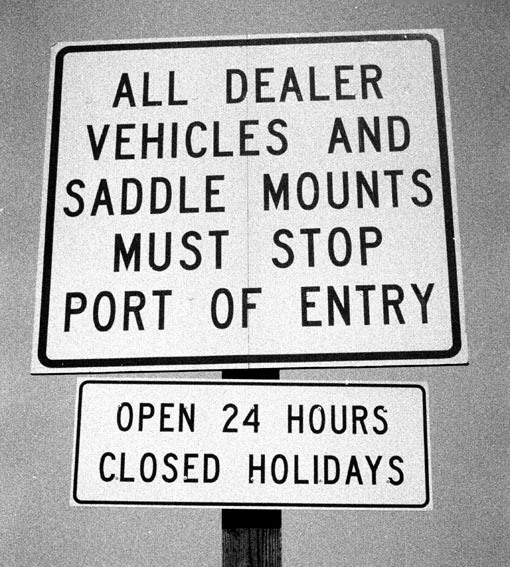 The final sign indicates that commercial vehicles also must stop at the Port of Entry on northbound Wyoming 585. Photo taken by Jonathan Winkler, 08/00. This Wyoming motorcycles state law sign is found on northwestbound U.S. 14 just past the interchange with Interstate 90. 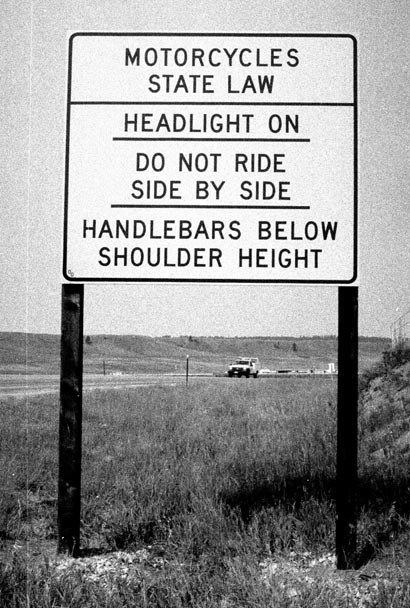 The sign is aimed at motorcyclists crossing the state line from South Dakota, where a major biker rally is held at Sturgis in the first week of August. Photo taken by Jonathan Winkler, 08/00. This reassurance shield along northbound Wyoming 585 is located near Sundance. 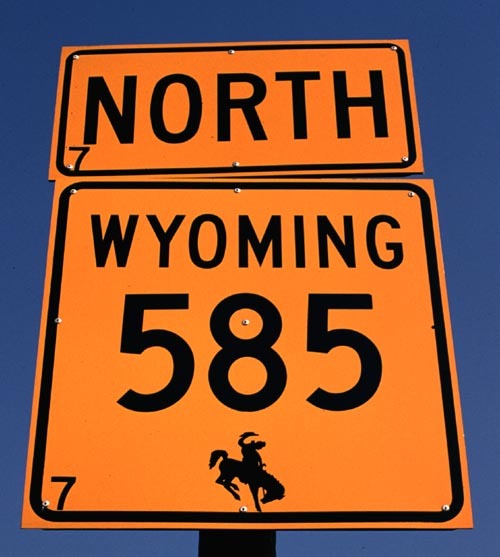 While some maps mistakenly show Wyoming 585 as a U.S. highway, it is really a state highway that has not been considered previously for inclusion in the U.S. numbered system, probably because it is a short route within the state of Wyoming. Photo taken by Jonathan Winkler, 08/00. 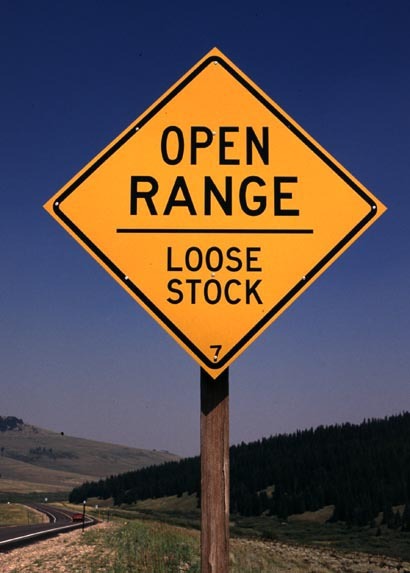 Many of the areas along Wyoming 585 are open range with limited or no fencing to separate Wyoming's well known wildlife and ranch animals from the highway. All motorists should be mindful of potential wildlife or ranch animals (especially cattle) in the roadway. Photo taken by Jonathan Winkler, 08/00. 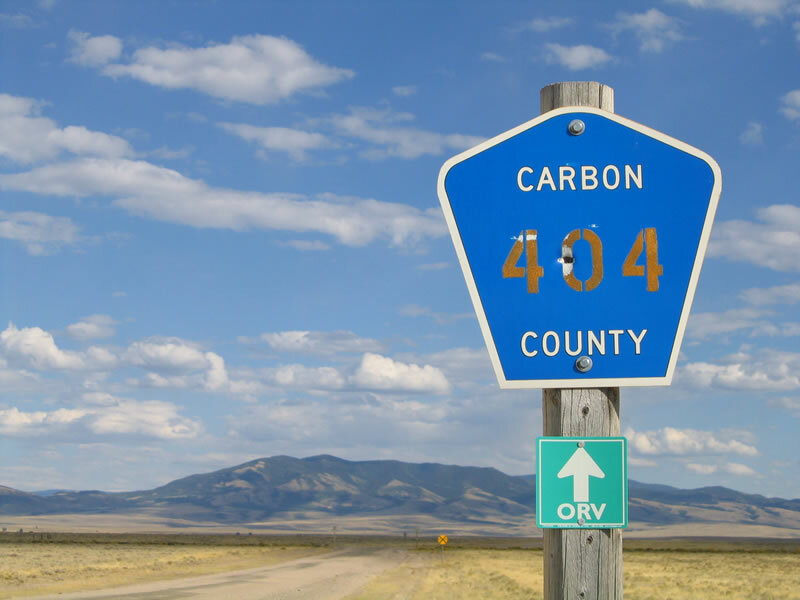 Carbon County Route 404 travels east from Wyoming 130 toward Elk Mountain in Carbon County at a point north of Saratoga and south of Walcott Junction. Photo taken 09/07/05. 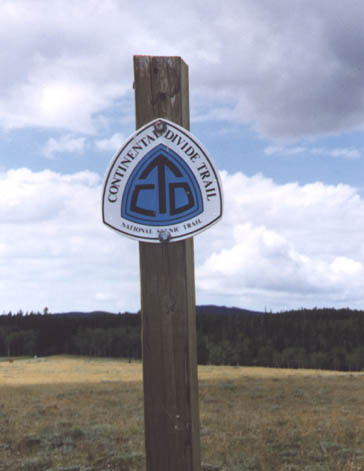 Continental Divide marker located on Carbon County Route 403, Little Jack Creek Road (locally pronounced "Jack Crick Road") where it passes over the Continental Divide. County Route 403 is actually within the Medicine Bow National Forest at this point, so it is also Forest Route 452. Carbon County Route 403 (Little Jack Creek Road) connects to Carbon County Route 500 (Jack Creek Road) a few miles to the north, and Jack Creek Road leads east directly into Saratoga. Photo taken 08/98. Carbon County Route 15 shield located at the Cooper Cove Road interchange, Exit 279 off Interstate 80. This shield is a very old shield, as most county route markers in Wyoming are the standard pentagons used nationally. Photos taken 02/05/02. Northbound Carbon County Route 15 (Cooper Cove Road) approaching Interstate 80 at Exit 279. 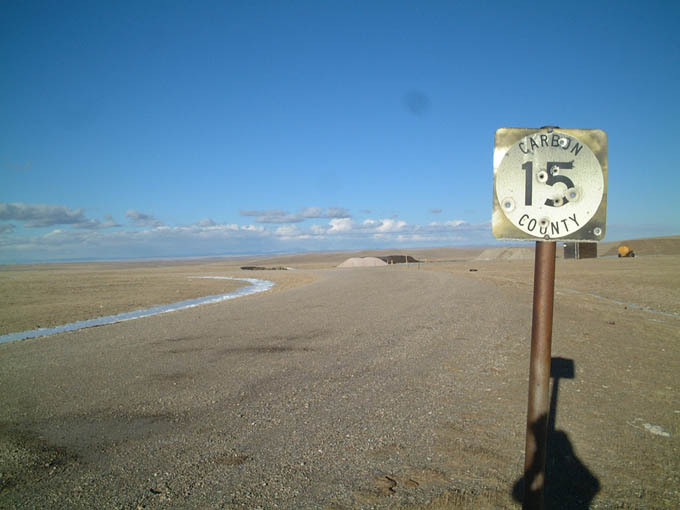 Carbon County Route 15 is a north-south route (dirt road) leading from Interstate 80 north to Wyoming 13 a bit north and east of McFadden. It passes by Bosler Reservoir (Diamond Lake), and it straddles the Albany-Carbon County Line, becoming Albany County Route 57 (Dutton Creek Road) at one point and then re-entering Carbon County. Photos taken 02/05/02. 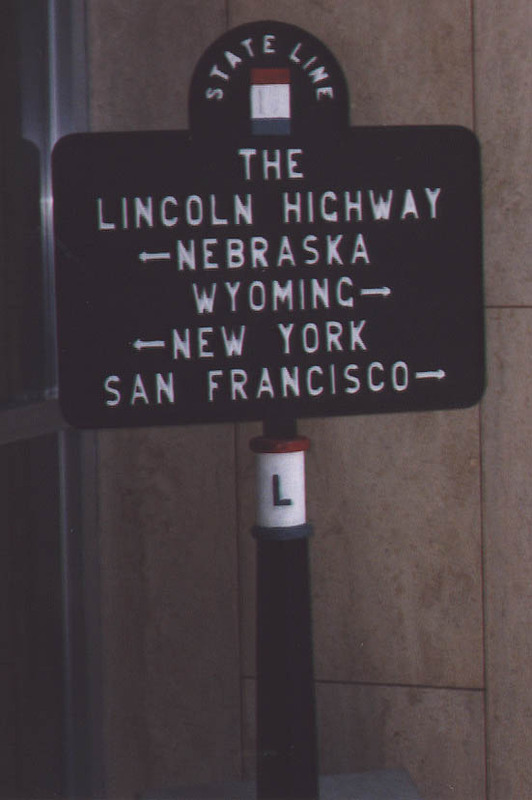 This photograph of an old directional sign for the Lincoln Highway was taken within the Wyoming Department of Transportation Headquarters lobby; it used to mark the state line between Nebraska and Wyoming near Pine Bluffs. Now it is preserved in the highway department building. Photo taken 08/98. Page Updated October 15, 2005.